Crewest Gallery News: FROM THE STREETS OF IRAN: OPENS TODAY! 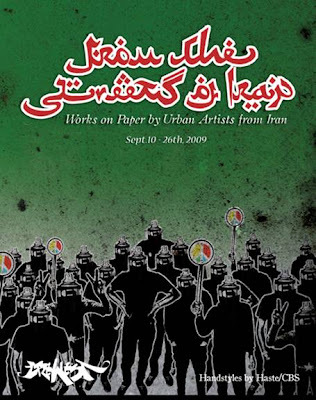 FROM THE STREETS OF IRAN: OPENS TODAY! 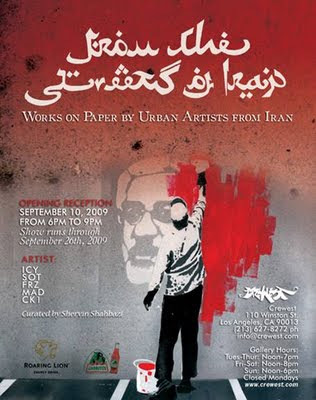 "Works on Paper by Urban Artists from Iran"
Crewest presents From the Streets of Iran, Works on paper by urban artists in Iran, curated by Shervin Shahbazi. This exhibit is the first of its kind in the U.S. featuring graffiti-based works on paper by ICY, SOT, FRZ, MAD, and CK1. These artists have exhibited their work in Europe and Australia, and this is their United States debut. The artists draw inspiration from Iran’s rich heritage of calligraphy, visual arts, revolution and the state in which they live, as well as their exposure to graffiti and urban art in the West. Their work encompasses a broad range of subject matter—from urbanism and political resistance to scenes of everyday people and the innocence of youth. Each of the artists practices their own aesthetic. In some works, detailed hand styles overlap with spray can imagery; in others, stencil work and careful attention to texture affect a stylized photorealism. However the individual styles may differ, the works as a group resonate with hope and a determination to realize the promise of a better future from the streets of Iran. My interest in urban art is rooted in the fact that not only it gives you the possibility of expressing anything you might have to say but also its instant access to the general public. My work is mainly about the social and political issues in my country as well as the world, and I chose stencil art for it is the best-suited medium for my purpose. My first exhibit was a group show in Tehran which was so well received that it inspired me and the rest of the participating artists to work harder and use the city walls to publicize the issues of our people even more than before. I learned about graffiti by watching video clips and skate boarding movies, not to mention CK1’s influence. I started working with ICY and SOT around the summer of 2003 when we collaborated on our first project, which led to forming the group, ICEPUNKZ. We learned by experimentation and although in the beginning we were just doing it for fun, but as days passed we got more and more serious. Later I realized that because of the situation in Iran, stencils are the best forms of communicating our ideas. My subjects are not limited to any particular issues. I make work about things that challenge my thoughts. I work on walls because people are so preoccupied with everyday life, that they don’t have time to go to galleries so we bring the art to them. I used to stencil logos of punk bands I liked on the walls of my room. I got exposed to street art through movies and photographs. I liked the idea of putting art on street walls where you can see it every day, so I started painting on walls in my neighborhood. I started small and as I got better I made bigger works. Life, people, and the city are my inspiration and all the struggles that impact our lives influence my work. I like to see the streets act as galleries that people go to on a daily basis. In Iran graffiti is considered a political offense. I was once detained for three days by the security forces for painting on the walls. My first serious piece was on the side of a highway. It was like a traffic sign that had the word LAW crossed out in red. I liked working on walls because on the streets you don’t have to obey formal academic rules that I had to deal with when I was at the university. One of the things I really liked was the illustrations that accompanied the manuscripts of two very popular Iranian poets-Hafez and Rumi- so I started working on canvas and experimented with combining the traditional Persian art with contemporary street art. I had become interested in print making in high school and chosen stencils for my work. What draws me to the wall is the suffering I witness every day. Poverty, hunger and misery deprive people from living a life of love and friendship. You see it in peoples’ eyes; sadness leaves no room to think about peace. I see these things and I want to communicate what I feel is life to our people, that’s why I love painting on the walls. When it comes to graffiti my story is very similar to others who paint the walls in Iran. I started tagging and putting stickers around our skateboarding hangout. Then as I got exposed to works of street artists in other countries through the Internet, I became more interested and basically taught myself to stencil and paint the walls. I do a lot of photography and sometimes I use my photos to work from. As my technique evolved I started working on social issues and problems that we all face in my country. I like painting on the walls because I like how walls can speak for me.